Each chamber has a filter paper incorporated which eliminates adding loose filter papers to facilitate handling of liquid haptens. The rim of each chamber has an adhesive layer to optimize adhesion to the skin and to eliminate leakage. This makes IQ Ultra™ a closed-cell system enhancing occlusion and confining the test reaction within the chamber parameter. The size of the IQ Ultra™ is small to allow the application of multiple test units to patients’ backs. The chambers are made of thin and soft polyethylene foam material to maximize patient comfort. The highest quality hypoallergenic surgical tape is used for the IQ Ultra™. Each strip of 10 chambers of IQ Ultra™ is attached to a protective plastic cover with corresponding compartments which makes it possible to re-attach the tape after advance filling of the chambers with the haptens. The Application plate for IQ Ultra™ makes advance filling of test substances even easier. The device is specifically designed for the IQ Ultra™. It is cost effective and saves nurses/technicians time, as they can prepare test series up to two weeks prior to use. Aqueous haptens should not be preloaded. IQ Ultra™ is made of additive-free polyethylene plastic foam with a filter paper incorporated. 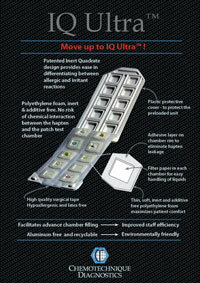 IQ Ultra™ is supplied in units of 10 chambers (in 2 rows of 5 chambers/row) on a hypoallergenic non woven adhesive tape. The tape with the chambers has a protective plastic cover with 10 corresponding compartments. The cover makes it possible to re-attach the tape to the cover after advance filling of the chambers with haptens. The volume of the chamber is 32 μl and the inside area of the chamber is 64 µl. The width of the tape is 52 mm and the length is 118 mm. The IQ Ultra™ is supplied in cardboard boxes containing 100 units per box (100x10 chambers).